North Korea mocked a U.S. show of force as bluster, calling flights by bombers near its border reckless "bluffing." 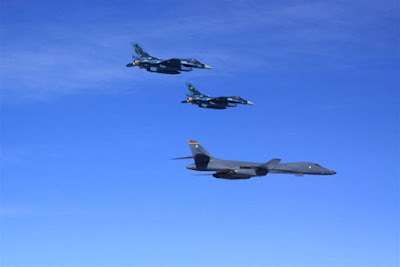 Two nuclear-capable American B-1B bombers flew over the Korean peninsula on Monday night, accompanied by U.S. F-16s and South Korean jets. It was a clear show of force in response to Pyongyang's controversial nuclear test last week. "The U.S. imperialists are going reckless, taken aback by the DPRK's successful nuclear test," state-run media said Wednesday. "They are bluffing that B-1Bs are enough for fighting an all-out nuclear war." A statement published by the official Korean Central News Agency the accused the U.S. of citing "provocations" by North Korea as a "pretext" for seeking the "opportunity of mounting a pre-emptive nuclear attack." It said those "extremely reckless" move are "pushing the situation on the Korean peninsula to the point of explosion hour by hour" and that North Korea is "sharply watching." "They had better stop their rash actions," the statement warned.